Numismatics is not just a hobby for adults. The future of the hobby is dependent on younger audiences becoming interested in collecting. Through programs like Coins for A’s and the new Adopt-A-School program, the American Numismatic Association is reaching school-age kids to promote curiosity and interest in numismatics. The Adopt-A-School program consists of educational kits to be used in a classroom setting. 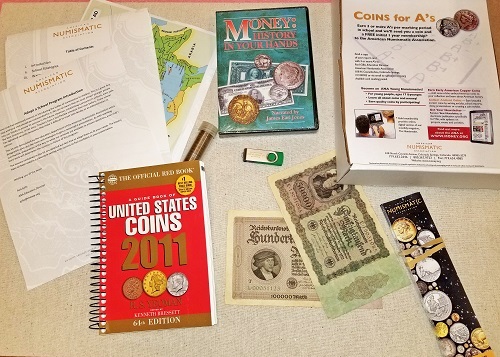 Parents, district representatives or club members can “adopt-a-school” and use the kit to teach students about the importance of numismatics while adhering to the educational curriculum. Various lessons included in the kit are geared towards different age groups, from upper elementary grades to high school. Each kit includes instructions to all the different lesson plans, a flash drive with presentations, pencils, coins needed with the lessons, reference books, worksheets, plans for an archaeological dig and more. The kit gives the user access to everything needed to successfully run the educational courses. Adopt-A-School kits are available for free to ANA member clubs – one kit per ANA club upon request. The kits can also be purchased for $24.95, postage paid. For more information or to order a kit, contact Tiffanie Bueschel at tbueschel@money.org or call (719) 482-9816.